Inﬁniti Consulting and SeyVu have signed an exclusive ﬁve year agreement targeted at serving public sector clients. The partnership will be focused on data science, predictive analytics and machine learning. 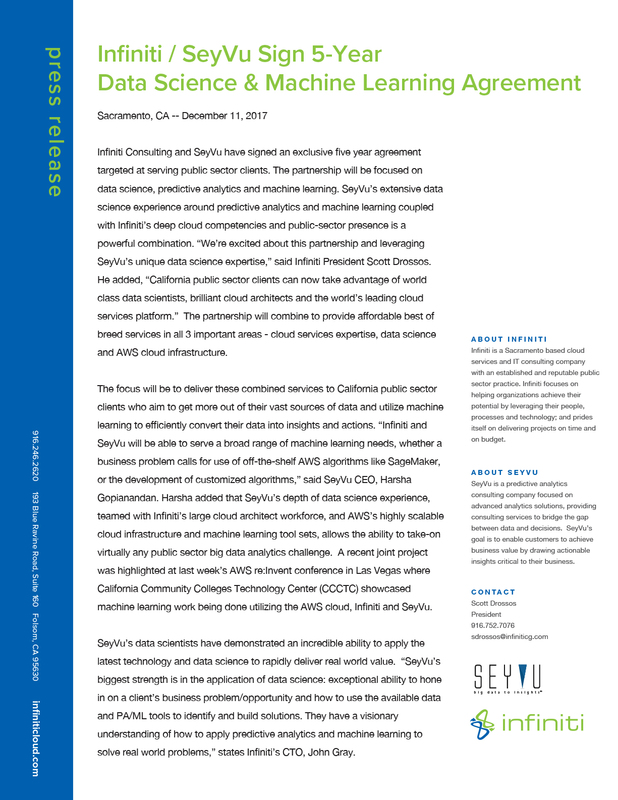 SeyVu’s extensive data science experience around predictive analytics and machine learning coupled with Inﬁniti’s deep cloud competencies and public-sector presence is a powerful combination. “We’re excited about this partnership and leveraging SeyVu’s unique data science expertise,” said Inﬁniti President Scott Drossos. He added, “California public sector clients can now take advantage of world class data scientists, brilliant cloud architects and the world’s leading cloud services platform.” The partnership will combine to provide affordable best of breed services in all 3 important areas - cloud services expertise, data science and AWS cloud infrastructure.